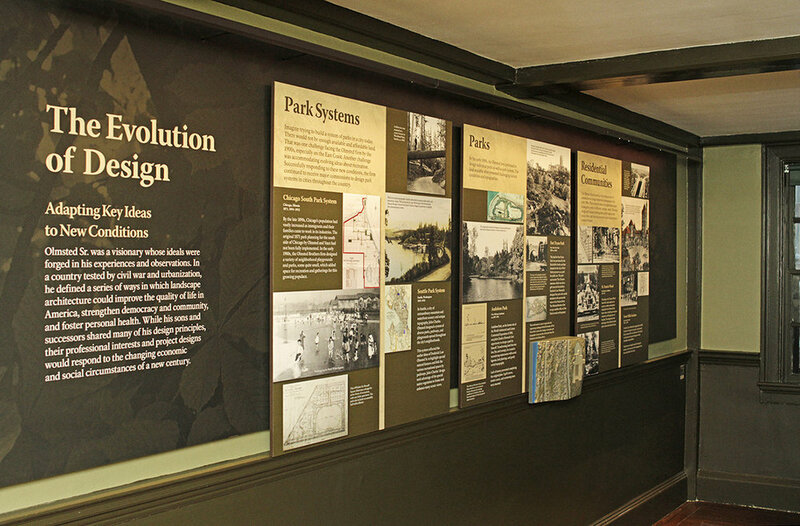 Formations designed, fabricated, and installed exhibits in the historic home of Frederick Law Olmsted. Exhibits provide an introduction/gateway to Olmsted Sr., the profession of landscape architecture and the Olmsted firm, Olmsted’s design principles, and a variety of different landscape types designed by the firm. All exhibits were meticulously designed in a way that did not alter or modify this historic building. Two interactive programs, hands-on exhibits, historical props, and a short video about Olmsted’s life provide more in depth learning, while fine furniture and historically preserved wall and floor coverings help re-create the setting of when the Olmsted firm operated in this historic home. *Awarded 1st place in the Interior Exhibit category and 3rd place in the Short Video category at the 2015 National Association of Interpretation (NAI) awards. Formations Inc. © 2019 Formations Inc., All Rights Reserved.